Attend A Lock Partnership is a Norfolk-Suffolk locksmiths partnership. 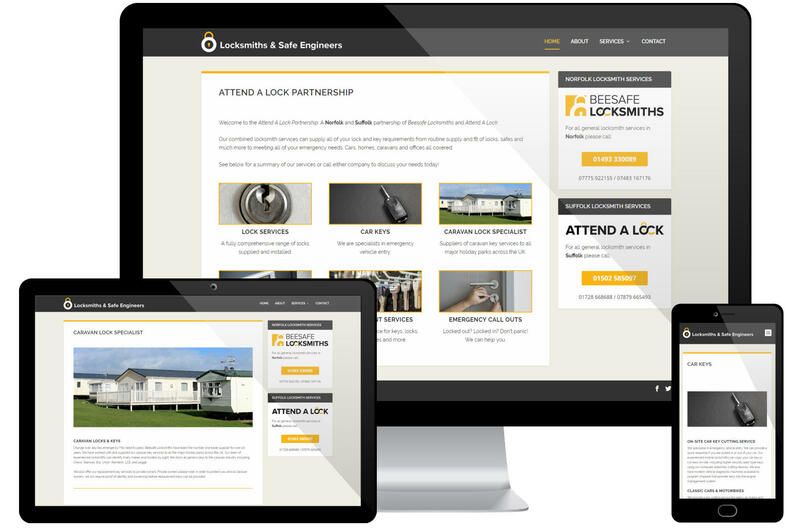 The two companies, BeeSafe and Attend A Lock, have worked in tandem for many years but the new website is a reflection of them becoming more officially partnered. Everyday lock services, including replacement keys, car key services and emergency call outs are overlapping but there are also some specialisms, such as the caravan lock services. Combining two businesses onto one website was a bit of a logistical challenge but one way we achieved this was by a redesign of both logos with a common feel and a simple matching ‘icon’ in place of any one logo at the top of the site. Quick links to the info for each company sit consistently on the sidebar for ready contact with either service.